We've had two races so far this year and they've both been fascinating, for different reasons. In Australia, we were faced with unknowns and left not quite sure whether our questions were answered. In China, we got more information and saw some great racing, but most are still on the fence about whether the new style cars are going to deliver a good season or a mediocre one. 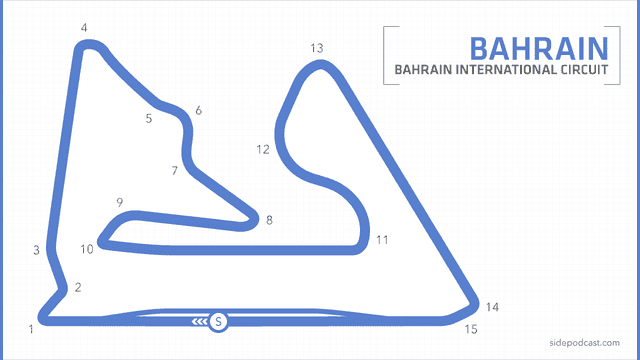 Bahrain is round three, and gives us another opportunity to see what F1 2017 style is like. It couldn't be closer in the championship at this super early stage in the season - Sebastian Vettel and Lewis Hamilton are the two to watch as they go into the third round hoping to win and gain that top place in the standings. Their teammates both have a lot to prove, however, with Bottas and Räikkönen waiting in the wings. Red Bull are also there or thereabouts, and need a few more races to show if they've got potential or just need more luck. Meanwhile, Pascal Wehrlein is set to make his F1 return, and drive his first race for Sauber, having sat out the season so far as he recovered from injury. That means bidding farewell to Antonio Giovinazzi, who probably doesn't mind too much after crashing ignominiously last weekend. China and Bahrain are back to back events, so there hasn't been much time for teams or drivers to take stock of what they learnt in Shanghai, but the conditions are likely to be quite different in Sakhir. There's a lot at stake as the Bahrain Grand Prix weekend begins. Support racing for this event includes TCR International Series, F2 and Porsche GT3 Cup Middle East. The anticipated weather is dry conditions but cloudy, and as it's a night race, the temperatures will likely be lower than during the day. You never know what's going to happen with F1, but I would expect to see all five sessions unfold without weather hampering proceedings, unlike last weekend in China. Bahrain has hosted an F1 race for more than ten years, but it doesn't get any easier for them. With political issues, a relatively dull race track, and the constant issue of sand blowing onto the surface to lower grip, it's not a favourite on the calendar. There are areas that make overtaking possible, however, so it will be interesting to see what this race can add to the debate about 2017's overtaking prowess. A lap of the Sakhir International Circuit begins on the long, long home straight which ends at a tight, second gear right hander. Jinking to the left and back to the right again, drivers embark on a second straight which builds up the speed, only for it all to be lost again in another tight corner that follows. The second sector begins with some flowing lefts and rights, before a first gear turn to the right leads drivers onto the mini straight that comes before the back straight. This mirrors the long start/finish stretch, and sends the drivers round some faster and more flowing sections. With some fourth and fifth gear corners, driver just have time for yet another long straight to end in a ninety degree right hander, before they are back on the home straight, crossing the line to complete a lap. For the first time in a long time, the FIA have made no significant changes to the circuit ahead of this year's running, with just routine maintenance being undertaken. This will be the 13th Bahrain race, and the fourth held under floodlighting, with Fernando Alonso taking the crown as the most successful driver around the track. Fernando Alonso had to sit out last year's Bahrain race and was substituted by Stoffel Vandoorne, who is now his teammate and will be relieved to have experience of a race track after two races being the rookie. Pole position isn't crucial at this track (only five polesitters have converted their grid position into a win), but qualifying well helps as the race has never been won from below the first two rows on the grid. Pirelli are more comfortable at the Bahrain track than at some of the others on the calendar as they have done plenty of testing there. They note particular issues with track evolution due to the surrounding sand, and that last year's race winning strategy was a three-stopper. Head of car racing Mario Isola says: "The biggest gains at Sakhir are all to be found in traction. It's quite a stop-start circuit, so getting the power down properly and keeping the rear tyres in good conditions is very important."